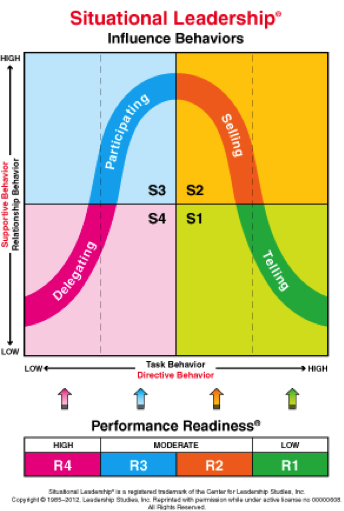 The Situational Leadership® Model is arguably the most recognized, utilized and effective leadership and influence tool in the history of the behavioral sciences. It is a powerful, yet flexible tool that enables leaders of all kinds to more effectively influence others. The Situational Leadership® Model utilizes a repeatable process that leaders can leverage to effectively influence the behavior of others. Its creator, Dr. Paul Hersey, often described it as “organized common sense.” At its core, Situational Leadership® provides leaders with an understanding of the relationship between an effective style of leadership and the level of readiness that followers exhibit for a specific task. Also, with application across organizational leaders, first-line managers, individual contributors and even teams, Situational Leadership® utilizes task specificity to serve as a mechanism through which leaders maximize their influence-related impact.